I managed to get tickets to Esperanza Spalding at Koko for A's birthday this year. Since it was a birthday night out, dinner seemed appropriate beforehand, and after a quick stop at Brewdog, we wandered into Daphne. It was a lovely evening and there was a nice table outside just calling to us, and the charming waiters quickly took our orders. 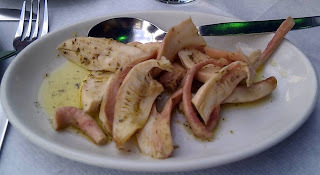 We had some bread, olives and octopus to start - I still love the grilled octopus at La Vina more than anywhere else I've had it in London, but Daphne's version wasn't bad. 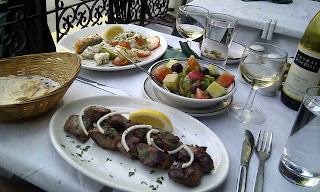 We then had a mixed seafood grill and lamb kebabs for mains, with a little side salad. Nothing was remarkable, but it was also all properly cooked and just what we wanted for a sunny outdoor meal. The bill arrived with what I would call Turkish delight, but when I exclaimed "Oh, Turkish delight!" the waiter ran off and brought back the box proclaiming it "Greek delight". We ended the meal with a laugh.